Saddle up your taste buds for the wild and zesty flavour of Taquitos Hickory Barbecue! Savour high grade, sun-dried corn grains, delicately toasted and deep fried to country style perfection! Then thrill to the exciting blend of delectable spices! You get more flavour with each crunch! Incredibly thin. Incredibly crispy. Incredibly flavourful. Taquitos Hickory Barbecue. A one-of-a-kind corn chip experience! Allergy Advice: Contains Soy, Wheat, Gluten, Mustard, Milk. Ingredients: Corn Flour (64%), Vegetable Oil (May Contain One Or More Of The Following (Palm, Corn Or Coconut Oil)), Barbecue BBQ Seasoning (Yeast, Flavour Enhancer (E621), Salt, Sugar, Colour (Paprika), Maltodextrin, Hydrolysed Vegetable Protein (From Maize/Corn, Soy), Anti-caking Agent (E341), Wheat Rusk Powder (Gluten), Flavouring, Mustard Seed, Skimmed Milk Powder, Anti-caking Agent (E551)), Sugar, Iodised Salt, Flavour Enhancer (E621), Natural Spice, Antioxidant. 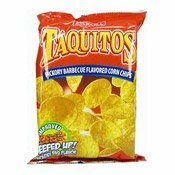 Simply enter your details below and we will send you an e-mail when “Taquitos Corn Chips (Hickory Barbecue) (珍珍燒烤味粟米片)” is back in stock!